Another week – another couple of pounds. I’m getting very close to breaking my target threshold weight of 180 pounds. Soon…very soon, I will be drinking beer again. I bought a new PC this week – it’s incredible how cheap they are now. Love it! Financial Uproar had a good post pointing out that ads are for idiots. JD Roth wrote a very good post saying that action is character. You are what you do – not what you say you want to do. Jim Yih has a new website called the Retire Happy. Jim explains what happens to your RRSPs when you die. Super stock picker Andrew Hallam is getting out of the race and is buying indexes instead of individual stocks. Canadian Couch Potato has some more dividend investing myths. Canadian Capitalist says that RRSPs are not so bad after all. Michael James points out that Bell has confusing bills. Intentional or just poorly designed? The Oblivious Investor wrote about your personal inflation rate. Dianne Nice of the Globe & Mail wrote about the annual RRSP guilt trip. An excellent article – financial companies sponsor stupid surveys to get publicity. 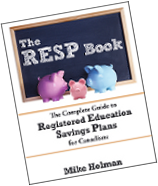 Maybe I should do one to help promote my RESP book? Rob Carrick wrote about the same survey and says that if you are young – don’t worry about your RRSP too much. Canadian Financial DIY is asking the government for Canada real return savings bond. Excellent idea. Rob Carrick points out that you should measure your portfolio with the right yardstick. Thanks for including me in your list. I really appreciate the support. Announcing about a new PC without specs? Shame! @Jim No problem. Good luck with the new site. @Traciatim – Sorry – I’ll try to remember to list some specs next week. I don’t even know what they are offhand. Thanks for the mention. Good luck with the continued weight loss. Thanks for the mention Mike! Have a great weekend! Thanks for the mention Mike. That beer is sure gonna taste good once you’re done.